So... as I think I've mentioned a few times before, I'm part of the Whirlwind Tour (organized by Novel Publicity) for She Wulf by Sheryl Steines. 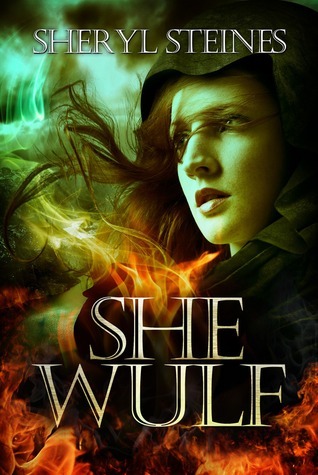 As my contribution to the tour I've got an interview with author Sheryl Steines as well as my own review of She Wulf which you can find below. She Wulf is the second book in a series, the first one being The Day of First Sun. However, I have not read the first book and I can say that you will have no problem understanding the plot of She Wulf even if you haven't read the prequel. She Wulf is now available on amazon and the kindle version is only 99 cent for the time being! He came through the centuries to find her, the girl who could save them all. Annie Pearce runs through the streets of the city, chasing a demon, the likes she has never seen before. As she works to find out where the demon came from, the Wizard Guard encounters something even more bizarre. A tenth century Viking. When Annie gets sucked into the past, she must struggle with the knowledge of the prophecy that tells of her destiny. The one she must fulfill if she is to return home. What happens in the past will change the world. 1. When you start a book do you know how it will end or do you create the ending as you go along? I have a rough idea of what the book will be about and I have some scene ideas and a rough ending. When I wrote The Day of First Sun, I knew that a high profile, non-magical person was going to be murdered by magic. I wrote out a paragraph of things that I wanted to see in the story and began writing. I didn’t look at the paragraph again until after the book was published and realized that I didn’t keep to my original thoughts at all. I tend to work without an outline because I feel tied to the story as if I’m trying to make everything fit. I prefer to let it flow and change. I like the freedom and the discovery. Sometimes I’m wildly surprised. 2. Do your book characters ever visit you in your dreams? Yes and no. Not as much when I’m sleeping, but I daydream about them all the time. It’s how I work out characters and storylines. It’s almost as if a movie is playing in my head and I can change and add to storylines. 3. What are your favorite authors as either an adult or a child? When I was a kid, I loved Nancy Drew. I read every one of them, but I didn’t just want to read them, I wished I had wrote them and started to write my own detective stories when I was seven. As I grew older, I read Judy Blume and Stephen King. Both made me feel something and from that I wanted to keep writing. I still read Stephen King and was very inspired by his autobiography On Writing. It was J.K. Rowling though, that reminded me of what I loved to read and that’s what inspired me to write my own fantasy novel. 4. How do you go about finishing a chapter when you can’t get it right? I skip it…Just kidding. No, actually I’m not. Sometimes, I make a note in all caps reminding me I haven’t finished the chapter and other notes that I might be thinking about for the chapter and start the next one. Sometimes you just need to move on. The answer will eventually hit you upside the head when you least expect it. 5. Describe your reaction when you saw and held your first book? I think I was numb when The Day of First Sun was published. Almost as if I had only done it to satisfy a selfish desire. It didn’t seem real. It was when I held She Wulf in my hands for the first time that I was overcome with emotion. This book consumed me for so long and I was so amazed by the final product and it seemed more than just a fantasy. 6. What is your biggest achievement to date? Writing my first book. I always wanted to and never gave myself the opportunity. One day I decided it was time. It changed my life, gave me confidence. I lost the extra baby weight, changed my wardrobe, straightened my hair and gave my girls a role model, an example of taking control of one’s life and being the best person you can be. Pink. I’ve always been a girly girl. As much as I’d like to be a sporty girl, I’m just not. It’s all about the pink, purses and shoes. I love the sound of rain on the roof. Not during the sunlight hours, but early in the morning when it’s still dark out. I snuggle under the covers. It makes me happy. 9. If you weren’t a writer, what would you be? An interior decorator. I love being creative and crafty and picking paint colors and getting lost in a fabric store. It’s almost as good as getting lost in a bookstore. I fear the alligators under the bed. Since I was a kid I can’t sleep without something covering my feet incase they come and get me. Don’t laugh, Stephen King admitted the same thing in an interview once. Note by me: I'm also a big Stephen King fan! And I can only recommend On Writing to anybody who's ever thought about giving the writer's life a try. I've read it several times and it's great advice on many important topics without being dry or boring! First off, I have to admit that I did not like this one as much as I had hoped I would. The premise sounded interesting and like there would be a lot of action, but somehow I wasn’t quite pulled in and I had problems with parts of the plot. That said, the novel shows solid world building and there were descriptive passages that made me sigh with happiness and wish the whole book was written that way. When I first started reading She Wulf, I was not aware that this book is a re-telling of Beowulf from the perspective of a woman as hero. Sure, the author has taken liberties and set the book in the present day with a time-travelling adventure element, but many aspects of the old legend are still in place. This brings me to another aspect that I liked about this book: the world-building was very well done! I know a bit about England in the 1000s from my Old English course and actually translated a part of Beowulf, too, and Steines did a good job at bringing that world to life in a believable way. Also the Wizard Guard (some kind of magical police), their lifestyle, and the magic Annie and the other characters can do was well thought through and made me want to know more of how the wizards interact with ordinary humans and about their history. My main problem, though, was that I just couldn’t connect with any of the characters, so quite often I didn’t really care all that much about what was happening to them. The novel is written in the third person, which makes sense because the perspective alternates between Annie (stuck in the past) and Cham or one of the other wizards in the present who are trying to get her back. Though I prefer first person narratives, I usually have no problem connecting with characters portrayed from a third person perspective if the reader still gets believable insight into their feelings and thoughts. But here, I somehow felt more like a distanced outside observer. Another problem with giving the reader such an omniscient perspective was that many new discoveries the characters make are told twice because both groups, past and present, need to find out about them. This made me feel like the book was dragging, especially in the middle. Maybe if I had read the prequel and knew how Cham and Annie got together, I would have cared more about them and rooted for their relationship. But having only read She Wulf, I didn’t really see any chemistry between them and was largely indifferent to Cham’s grief when he was left behind in the present. I wished he would stop moaning and moping around her desk and actually do something, like the others! I lost count of how often he cried or had tears in his eyes. I like it when men show some feelings, but he just came across as weak and unable to take action on his own. I cared more about Spencer, Annie’s newly assigned partner, who always looked out for her and took care of her when she got sick in the Viking’s village. Later, when it is revealed that Annie is part of an ancient prophecy and actually supposed to be in the past to fulfill her destiny, I must admit that I didn’t understand why it was so important that Cham get to her at all. I felt like he didn’t trust her to get the job done. What I enjoyed was that part of the story was told from the Viking’s perspective! I really liked his voice and the glimpse inside his head I got with that, and it was interesting to see Annie through his eyes. Generally I liked the parts that dealt with the Viking village and their relations to the Coven of magicians (the two don’t really get on). Both groups kept secrets from Annie and Spencer and trying to figure out who was friend and who was foe kept me guessing. I also liked the descriptions of the demon attacks on the village a lot, they were realistic. The way to defeat the demons, though, was something I thought the Coven should have been able to figure out on their own, without bringing in help from a thousand years in the future. Overall, this novel shows great ideas for creating a magical world parallel to our own, good historical research, and a well-structured plot arc. The characterization and some of the story-telling narrative aspects just weren’t for me. I think I’m not romantic enough. If you’re a fan of lovers parted and trying to find a way back to each other across space and time you should give it a chance though. The mixture of demons, old English lore, wizards, magic, portals, spells, and time travelling is pretty unique! I don’t like giving this one a ‘meh’ review, but I also want to be honest. I hope I could provide a fair assessment of what I thought were the strengths and weaknesses of the book. Judging from some of the other reviews I’ve read I think it just wasn’t my cup of coffee. I want to read this book - seems absorbing! Carmen - Thanks so much for taking the time to read and review She Wulf. I appreciate your time in helping promote it. Thank you for taking the time to read it. I wish you all the best in your future writing career! This was a very well thought-out review, Carmen. I think you did a great job discussing both what you loved and didn't love about She Wulf, and I appreciate your perspective. Thanks for joining us on this tour, and if you have a moment, would you please cross-post to Amazon and GoodReads? Thank you :) I'm sorry I couldn't unreservedly praise the book, but I'm glad to see that I found a good balance of highlighting aspects I liked and disliked. I've already cross-posted to goodreads and I can also post the review on amazon as soon as I have a sec figure out their system. Thanks for letting me be part of the tour! Thank you for trying to help me :) I tweeted? her and facebooked her to see I'm now waiting on her reply. Thank you Carmen!